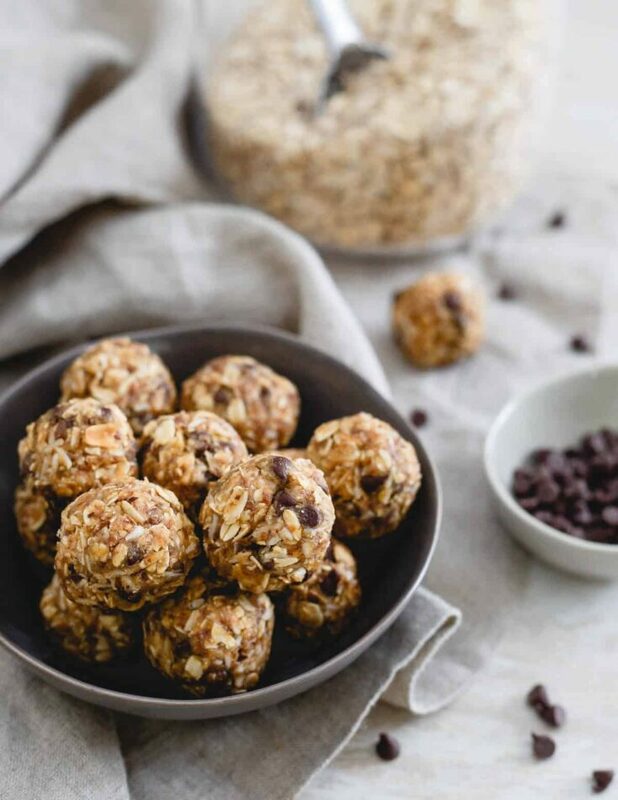 These no bake peanut butter chocolate chip balls taste just like a Reese’s peanut butter cup but made with all real food. They’re the perfect tasty snack when you’re craving a sweet treat! This recipe for no bake peanut butter chocolate chip balls was originally posted in March of 2012. It was one of my very first ball recipes and I remember being totally baffled by the fact that I didn’t have to make snack bars in the shape of, well, bars back then. This recipe sparked an obsession with snacks rolled into the shape of balls that still lives on strong (I even have an ode to snack balls on pinterest) and when I sort of rediscovered it a few weeks back while browsing the archives on here, I knew it needed to be next in line for a makeover. The photo skills of 2012 Gina were doing nothing to showcase how delicious these babies are. The video pretty much tells it all. These are super easy, guys. Outside of the 30 minutes the dough spends setting up in the fridge, hands on time is a quick 5 minutes and you get snacks for the entire week (or half a week depending on how much you go to town on these delicious little bites). When I said they taste like a Reese’s peanut butter cup, I’m not even exaggerating. The flavor is spot on. 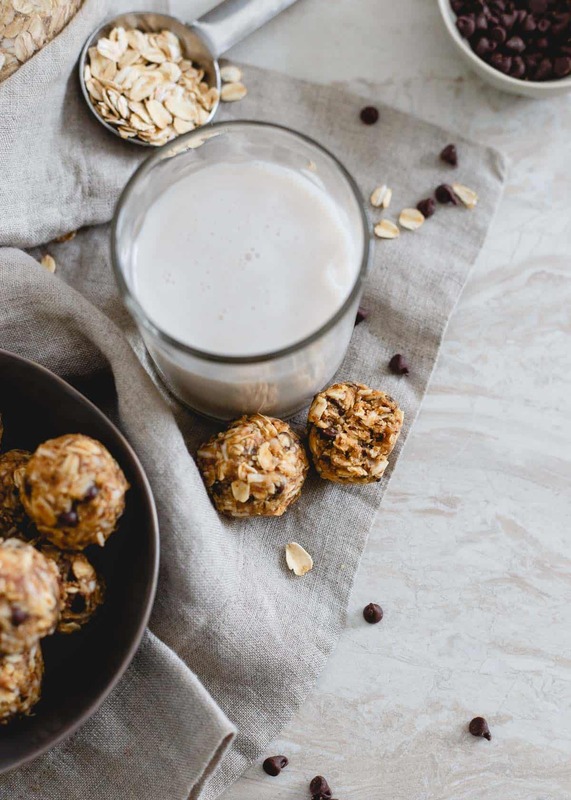 With ingredients like oats, almond flour, flax seed, coconut flakes maple syrup and peanut butter though, you can feel a lot better about popping back a couple of these than the processed candy. I’ve been on a kick lately of having small snack bites like these (raw brownie bites and whole wheat sweet potato banana muffins have also been on rotation) on hand at all times. I don’t really know why it took me so long to embrace this whole meal prep phenomenon thing, but between cooking large amounts of protein on Sundays and making small, healthy snacks for the week, it’s made staying on top of my nutrition goals so much easier. It was never hard per se, but being able to grab something pre-made as I run out the door to the gym every afternoon rather than adding up macros of 2-3 different things has really just simplified life. 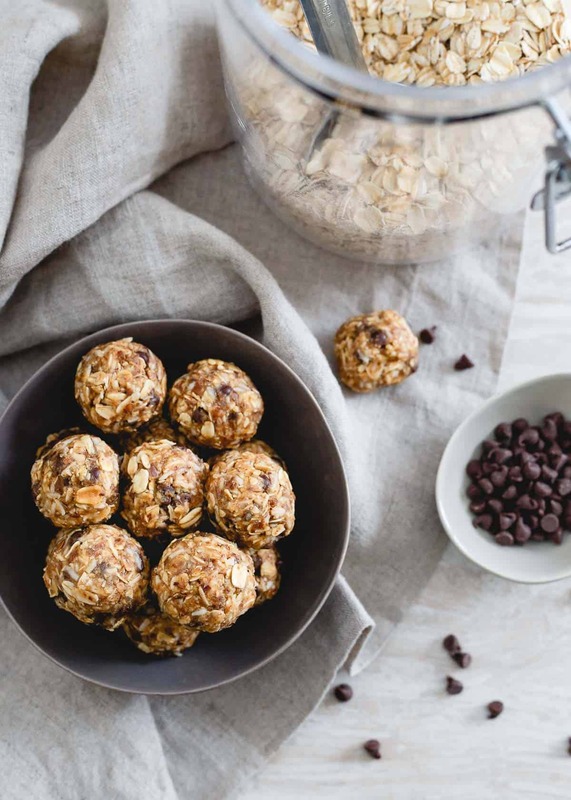 And when simple comes in the form of no bake peanut butter chocolate chip balls that taste just like one of my all time favorite chocolate candies, I think we can call that a win. These no bake peanut butter chocolate chip balls taste just like a Reese's peanut butter cup but made with all real food. They're the perfect tasty snack when you're craving a sweet treat! Add oats to a food processor and pulse a few times until finely chopped. Add oats and remaining ingredients to a medium bowl and mix together with a spatula until well combined. Roll the mixture into balls using wet hands. If the dough is too crumbly and not sticking together well, add a few drops of water as needed and remix until it stays together well when rolled. Place balls in a storage container or bag and keep refrigerated. I am on a Peanut Butter Strike this week and than you show me your balls!! I can’t make them till next week! :( WYAW looks wonderful, the breakfast and lunch look delsih!! Peanut butter = food of the Gods. Ok – couldn’t wait so just made these with my 4 yr daughter before school b/c we had all ingredients on hand. OMG – seriously yum and I think I just found my new favorite kid-friendly healthy treat. I love anything that tastes like a Reese’s Cup and especially anything that won’t dirty a kitchen appliance! Pinned! I cannot wait for the new season of Mad Men. March 25 is the date I think? I’ve never watched Downtown Abbey but have heard a lot about it lately. Love your pictures. These look really delicious! Uh OK. When I get done with this “I gave up sweets” nonsense, those no bake balls are on my list of things to make. Holy yum! They look and sound fantastic! I’m with you on pasta. I’ve been on the healthier track for almost a year now and I know a lot of it is due to not eating a ton of carbs like pasta. I’m so scared to eat too much or not have enough of veggies and nutrients to go along with the pasta to justify eating it! :( It’s a struggle, but I’m hoping it will pass soon! I’m oddly so happy to find a “balls” recipe that does not require a food processor! For some reason, that step always intimidates me, especially since I just have a magic bullet. Thanks for the recipe!! I definitely see some green snuck in there! It’s not all peanut butter and chocolate, although wouldnt that be nice. About to check out that workout of death, I need a good one this morning. I’ve been pumped to see this recipe since I saw these on instagram last week. Love it! Is it weird that I see the picture of the bowl of tipped over oats and it makes me uncomfortable because all I can think about is cleaning it up? Something is wrong with me. haha, I think that way when I see people’s pics that have things dripping down the side of them. Oats are a lot easier to clean up that drinks and chocolate running down onto the plate/placemat/table! Those look amazing and have all of my favorite ingredients! I love no bake balls! “No bake snack balls that taste just like a Reese’s peanut butter cup.” <— REALLY???!!! Ok I am all about these. I have soooo many versions of PB balls and PB cookie dough balls. Would have never thought that the coconut helps with the Reeses taste or that it doesn't overpower the rest…but I trust you and wanna try! your photos and positive energy are ALWAYS so inspiring Gena. sorry I never comment but I just love your spirit and story! Yeah baby!! I’ll have to leave out the coconut for myself (texture thing) but the rest of it looks awesome and this will come in handy to help boost the calories I’m adding! YAY! Do you have almonds? Almond flour is just ground up almonds. I wouldn’t use regular flour since they’re no bake, I’d just grind up any kind of raw nut you have (cashews, almonds, walnuts, pecans). Or, just use more oats and forget the nuts all together. I was just going to ask this – awesome. I have lots of nuts in my freezer! I must say that I admire your balls (teehee) – seriously – you have some great ball recipes! I loved the no-bake chocolate chip cookie dough balls. Just made these a few minutes ago – inhaled 3 of them – they’re delicious. And all for me, since my husband hates coconut! I want to be besties with the Dowager Countess. She is the best. We both laugh so friggin hard when she cracks jokes b/c it’s so out of character. Hysterical. Cornbread bake!!! I have to make one! Recipe on the site?! Yum– your meals all look so gourmet in this post!! Love all those veggies on top of the pasta– definitely a good way to avoid going on a carb overload! I have got to finally make dough balls! They look so delish. Yummy :D Some of my favorite peanut butter ball type things are ones made with coconut. It’s just so delicious. I need some of these in my life, it’s been too long since I made anything like them! Also, your wrap looks so good. I think the sprouts are calling to me – I haven’t had any in way too long too! Can I sub oat flour for the almond flour? Balls are my hands down fave thing to have on hand (pun intended) for a quick snack. Love all the variations. A healthy version of a peanut butter cup? I am so in. Just as soon as I buy some more coconut. I don’t think the coconut was key if you want to try them even sooner ;) Just add a bit more oats or flax. If you have almonds, just grind those up. Almond flour is just that. I wouldn’t use regular flour since they’re no bake, might taste funky. Try grinding up whatever nuts you have on had or use oat flour (ground up oats) instead. Omg, your breakfast picture is making me wish it was 7am already. And that is incredibly hard to do since I am SO NOT a morning person!! I am going to make these this weekend, or tomorrow b/c I don’t think I can wait! I am also curious about substituting almond flour…Does whole wheat pastry flour work instead? Or oat flour? I can’t wait to try these. They look delicious! i would use oat flour, not pastry flour since they’re no bake. See my comments to others though..almond flour is easy to make yourself, just ground up almonds! I just made those and had to refrain myself from eating them all for breakfast. They are FANTASTIC! So many tempting balls recipes on your blog, I want to try them all! Thanks for this one, I have a feeling I’ll make them frequently. Thank you for such an awesome recipe!!! I made these this afternoon and they have already been eaten with requests to make more:) I rolled them into 1tsp. size balls and my kids were eating them by the handfuls. Even my “can’t stand to eat anything healthy” husband put down his fig newtons and had 2!!!!! :) They were exceptional!! Thanks again! I just have to say thank you. I make this recipe ALL the time. I call them Power Ball Cookies and my young kids eat them up. They are my husband’s favorite cookie. I bring them to work as a healthy dessert alternative. THEY ARE AWESOME!! Thanks for the great recipe!! I made these the other day and they are FANTASTIC!!!!! I absolutely LOVE them. Will definitely keep this recipe on hand to make over and over again :) Thank you for sharing!! mine were delicious! but they lacked a little stickiness and didnt really stick together. help!!? If they’re having trouble holding shape just use a touch more maple syrup and/or peanut butter until they come together more easily. Wet hands also help while rolling them. I’m running to the kitchen to make these. Immediately! They’re brilliant. How easy are these Gina?! They sound delicious. Perfect little afternoon pick me up! Can’t wait to make these with one of my boys! These are exactly what I need for a quick breakfast on the go! What a perfect snack!! These sound awesome! Snacktime is saved!!! These are so darn cute, so easy, and look so delicious. Cannot wait to try them! 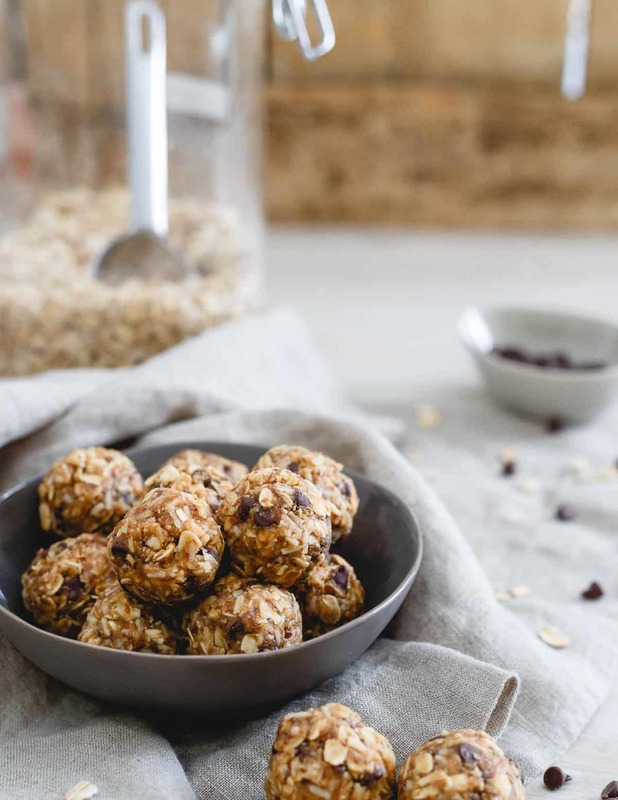 I love no bake energy balls- totally going to make these! We would love to feature these in our magazine Missouri Magazine. Feel free to email me ginamatsoukas AT gmail.com to discuss! Sounds great. Sent you an email. Thank you! It’s rolled oats and you can leave out the coconut but I’d replace it with something else otherwise your consistency will be off. More oats perhaps or something else you like with a similar texture. Don’t have the flax, can you just add more oats or almond flour? Yep, that’ll work just fine. I just ran out of almond flour (and have no almonds in the house) but I have coconut flour – will that work? I wouldn’t suggest that swap. Coconut flour really isn’t a good 1:1 substitution. It would work better with another nut flour.